Can’t decide between Asian or Italian? 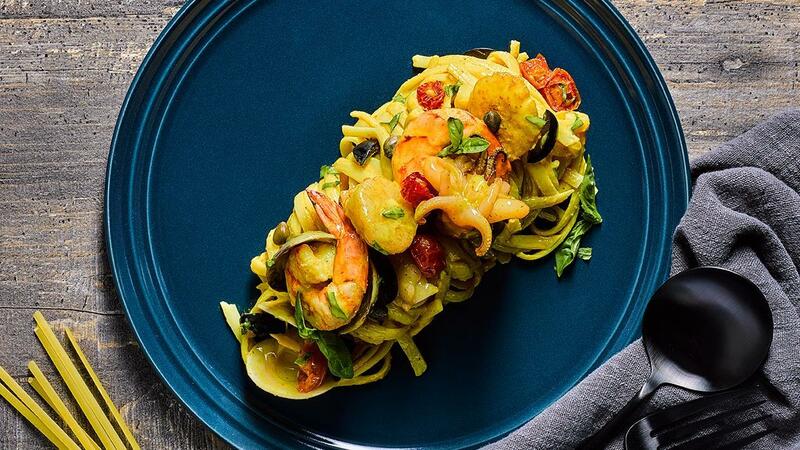 Why not both with this elegant medley of shellfish and pasta with a unique Asian touch? Heat up water in stock pot, season with Chicken Seasoning Powder and olive oil. Blanch linguine for 5mins, drain and cool off in chiller. Drizzle some olive oil to prevent pasta from sticking together. Heat up saucepan, stir fry all seafood in hot pan. Deglaze pan with white wine, add in South East Asian Spice Paste and coconut milk. Mix well and add in linguine and toss well for 2mins. Fold in cherry tomatoes, taggiaca olives, capers and basil. Plate it in pasta plate and garnish with Basil Sprig.